The first Presbyterian Church in Limerick was built in 1817 to accommodate the increasing Presbyterian congregation in the city is hidden away down a little alley and is very difficult to photograph. Rev. John Pinkerton died on December 21, 1840 at his house on Glentworth Streeeet. He was 72 years old and had ministered at the Presbyterian Church off Glentworth Street since it’s foundation. As there was not a separate Presbyterian graveyard in the city his remains were interred in St Munchin’s Church of Ireland graveyard. The second Presbyterian Church was erected on the corner of Henry Street and Lower Mallow Street in 1901. 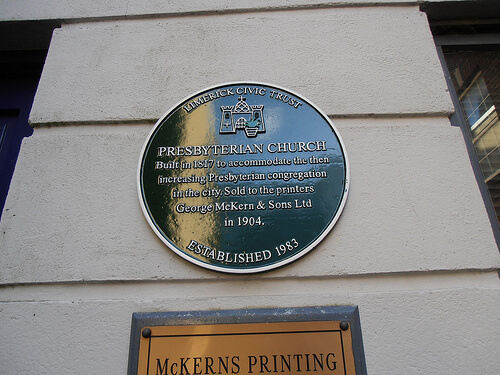 The original Presbyterian Church was sold to the printers George McKern and Sons Ltd. in 1904 who remain there to this day.